Caption slip reads: "Photographer: Wesselmann. Date: 1958-06-24. Reporter: Alone. Assignment: Promotion shots for George Sjostrom. 11/12/2/13: Stationary web ready for press start -- Pressman Ted McKee folder, conveyor to mail room -- Pressman Kenneth Kent at left, Pressman Arnold Apper at right. 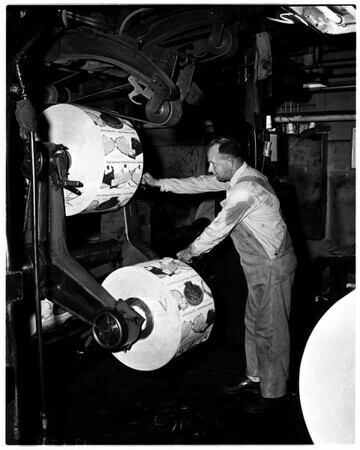 17/18: Paper handler Jack Kuzia moves special color rolls inot ready roomn".